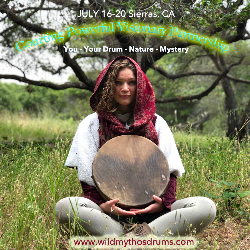 Join Us July 16-20th, M-F, in the Sierras on the American River for an inspiring and relevant Wild Mythos Drum Journey of 5 days and 4 nights immersed in a courageous conversation with Soul, with Purpose, with Vision, with Mystery and the Web of Life. Program fee has been slashed from $650 to $525! We begin Monday July 16th at 3 pm and complete Friday July 20th at 1 pm. At the center of this offering, we are inquiring: What does it mean to be a carrier of a living drum, of a sacred drum in this urgent and evolutionary passage on Earth? 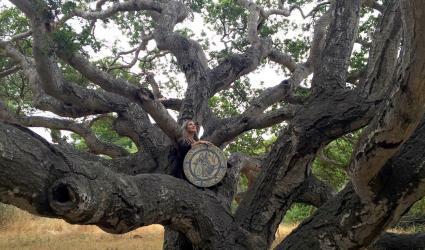 What is the response ability, what are the ways and means to bring connection, vision, evolution, an eco and soul centric life, and reclamation of the sacred to your people, via your animate and soul fed partnership with a living drum that personifies the most ancient rhythmic language of life? 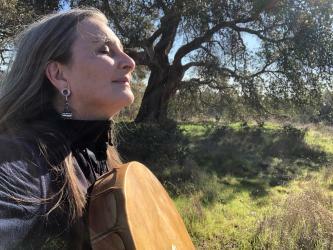 How is the liminal gateway opened for shapeshifting image and experience through our song/prayer/dance with our sacred drums and how is it our first language of connection, of holy reciprocity, of the journey to soul? How does this sacred partnership serve the Web of LIfe and the Dream of the Earth in these urgent times? Come find out this July on the wild part of the American River in Tahoe National Forest July 16-20 with a group of deep diving, deep listening mystics and seekers of soul. Courting Visionary Purposeful Partnership With Your Sacred Drum is for ministers, teachers, coaches, therapists, poets, healers, visionaries, dreamworkers, imagineers, cultural evolutionaries, heart broken open soul activators, guides to deep belonging to and romancers of the circle of life. Practices will include: drum journeys, dreamwork, deep imagery, courageous conversations with the more than human world, council of all beings, personal designed ceremony, song, prayer, somatic inquiry, wild wandering and more! You know you are here to serve the Greater Good in these initiatory times on Earth with your heart facing forward and wide open and you often are exactly that in partnership with your drum. Don't hesitate, Join Us!